I wasn’t sure if I’d write anything about my current trip until I got back, but I do have some time to kill this morning. I can cover yesterday’s events. The next two days will be written about when I get home this weekend. Earlier this year, a friend of mine and I decided to buy tickets to a comedy show up in San Francisco. He’s a golfer, as well, so naturally we decided it was a perfect excuse to plan a little golf trip around the show. 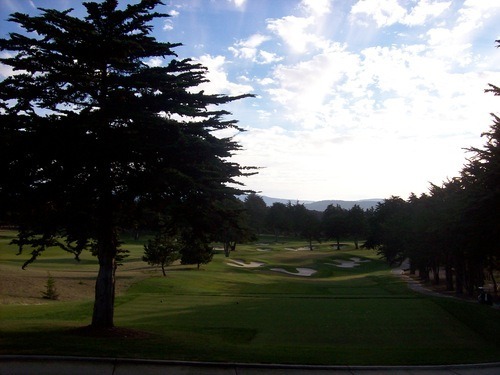 We headed off early yesterday morning and drove toward the Monterey Peninsula for our first leg of the trip. 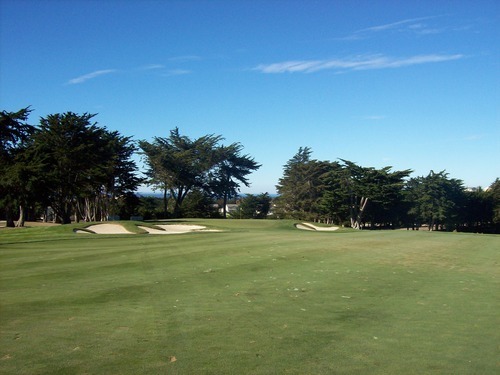 The main reason we headed this way first is because I got an invite to check out Quail Lodge Golf Club in Carmel. That round is today, so more on that later. 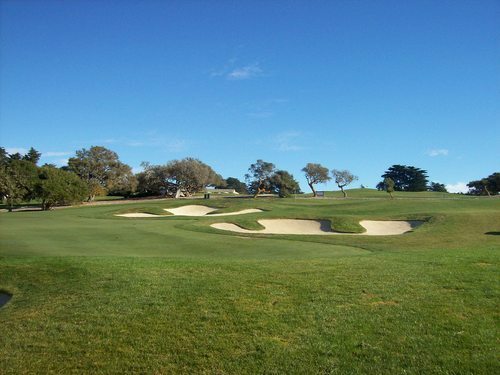 But with that Quail Lodge booked for today, we decided to stay in Monterey last night and golf in this area yesterday afternoon. 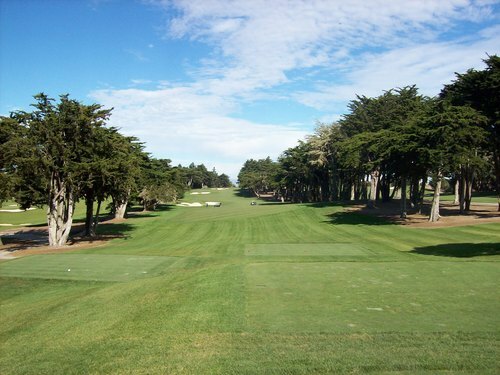 Based on the best price and tee time availability (not to mention a course I hadn’t played yet), we chose Bayonet & Black Horse in Seaside. 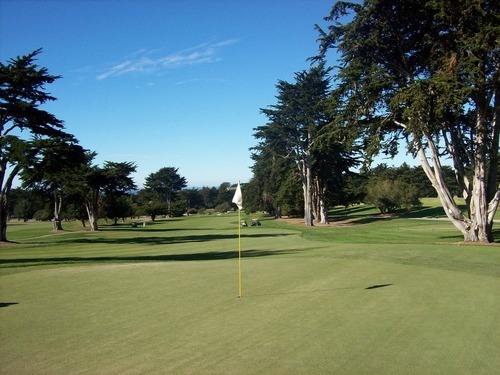 We would play the Bayonet Golf Course. These two courses were already “next” on my wish list for this region, so I was excited to get to play one of them on this visit. On the drive up, we stopped and ate breakfast at a little roadside trucker diner called Wild Horse Cafe. The old school atmosphere was more enjoyable than the food, but it was a hearty enough breakfast to get us through the day. Our tee time was at noon. We got there early to warm up and check things out. 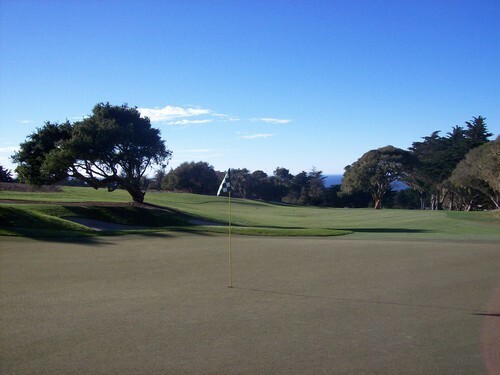 The weather was gorgeous and the courses looked great, so we knew it was going to be a good day. Our rate today was $59, which is a steal of a deal for a course of this caliber. 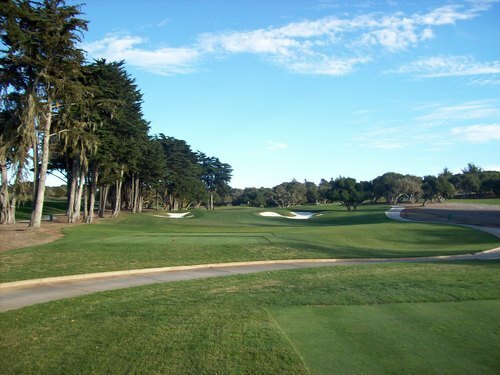 We teed off right on time and were paired with a single, who was a real nice guy from Santa Rosa. Unfortunately, we were stuck behind a very slow foursome on the front nine. 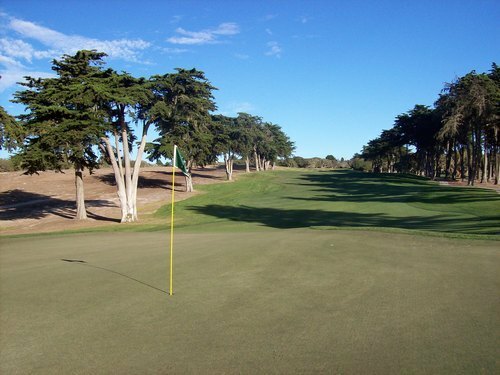 They ultimately let us play through on the 10th hole, which made the back nine go smoother. All in all, the total pace for the round was 4:15, which isn’t bad at all. I enjoyed the course a lot, but not quite as much as I was wanting to. The front nine was solid, but a tiny bit disappointing. The back nine completely won me over, though, with a lot of fun, unique and challenging hole designs. 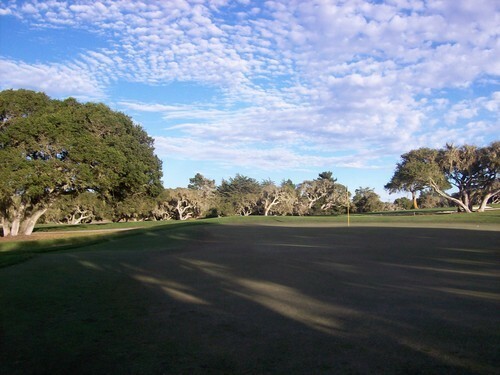 The 10th and 18th are great par-5 holes, perfect “book ends” to a wonderful stretch of holes on the back nine. 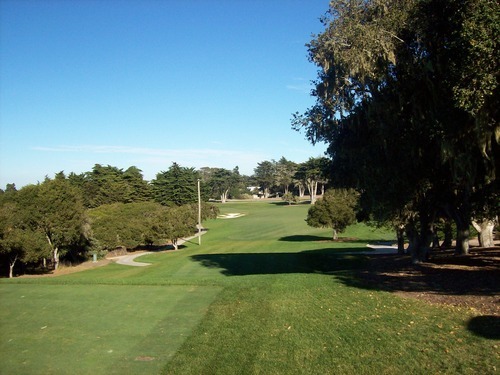 Bayonet has a true Bay Area feel with hilly terrain, plenty of trees, fairways that get pretty tight in places and a good mix of dogleg hole layouts. The greens stand out here. They are fairly large and feature ample undulation (along with some subtle and hard-to-read breaks) to keep you guessing. They are also quite fast and unforgiving on putts and chips. The greens here are also very well protected with some big bunkers and obscured angles/views that come with such naturally undulating terrain. 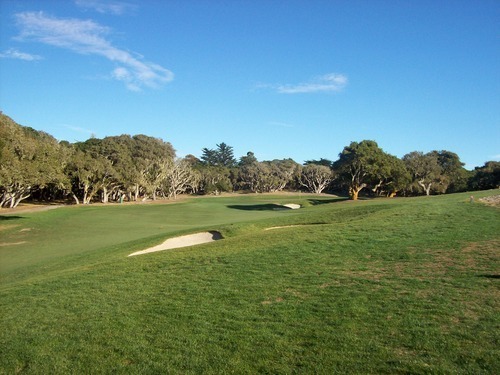 When you add it all up, Bayonet is definitely a challenging course that tests all your skills. 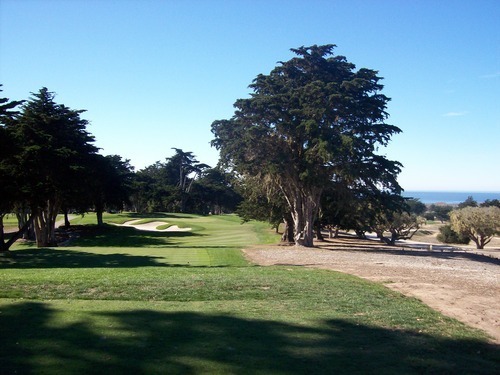 I knew Bayonet & Black Horse were more inland courses (though not really that far from the ocean) and I was led to believe that there weren’t many (if any) views of the water from the course. 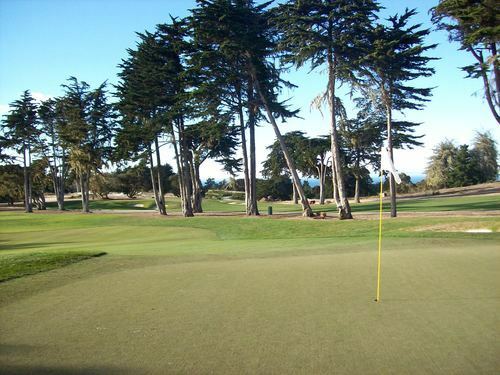 I was pleasantly surprised that Bayonet offered many great panoramic vistas with the sparkling Pacific in the background on such a clear afternoon. 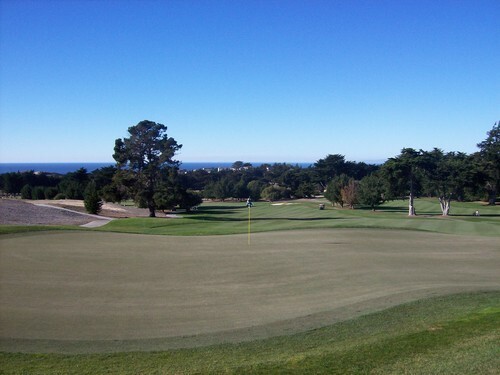 There are many elevated points on the course that give you very scenic views. The course was not quite in as good a shape as I was hoping after reading the last very recent GK review, but still good overall. 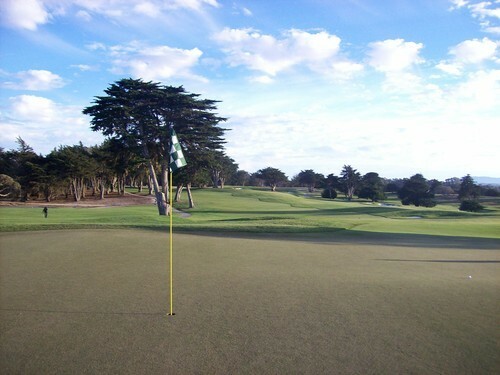 The greens on Bayonet had just been top-dressed earlier this week. It didn’t affect play too much, though. A few putts were a bit bumpy, but they still ran very quick and the approach shots held fairly well. The fairways were decent overall. Though mostly green and lush, some were very firm and thin and others were a bit softer. It was a little hard to get a consistent feel on them from hole to hole. 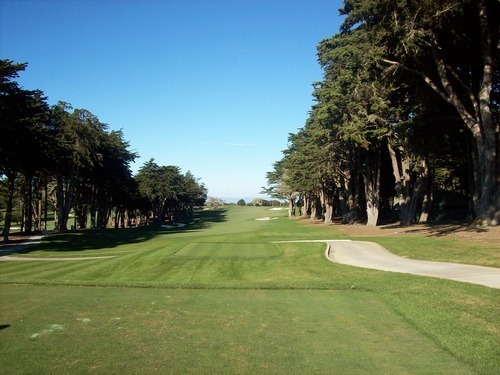 The rough was nice—not cut super deep and nicer to hit from than some of the fairways. The sand is excellent. It is really heavy, soft white sand. Fantastic! The tee boxes were nice and level throughout. For the price we paid and the weather we got, it was a wonderful day on a fun and beautiful course. I would definitely recommend Bayonet and I look forward to coming back someday soon to check out Black Horse, which many people seem to prefer between the two. We stayed the night in Monterey and ended up eating dinner at a little Italian place down the street from our hotel. It was Caruso’s Corner and it was one of the best meals I’ve ever had in my life. For an appetizer, they give you this warm soft sourdough bread that is to die for. I ordered some lasagna and my friend ordered the chicken parmesan. Portions were huge and the food was absolutely delicious. Fantastic restaurant that I highly recommend if you are in Monterey! Note: Caruso’s Corner is now closed and I’m very sad about it. 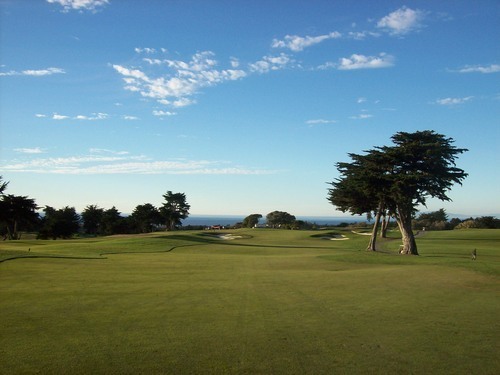 Tomorrow we play Quail Lodge in Carmel and then we’re playing at Cinnabar Hills in San Jose on the way back home. I’m expecting great things out of both courses, so it should be a fun rest of the trip.